The right dental braces colors can give you a customized look like nothing else can. Having colorful braces can go on to add the right amount of color trend to your smile. When you visit your orthodontist, ask for all the possible colors that you can have your braces on. You will be given choices for your braces based on several different color combinations such as the colors of your country, your favorite colors, and colors of your schools and so on. You could either stick to white braces for your teeth depending upon your choice. Braces aren’t really a lot of fun to wear but you can spice them up and make them the latest fashion accessory by adding color to them. The colored braces will ensure that they look stylish. There are almost 30 different colors in braces that you can choose from. The process of choosing these colors is made easy by the color wheel. Keep in mind that the color on the wheel might not be the exact one on the braces. The best color and also frequently chosen for braces is blue. 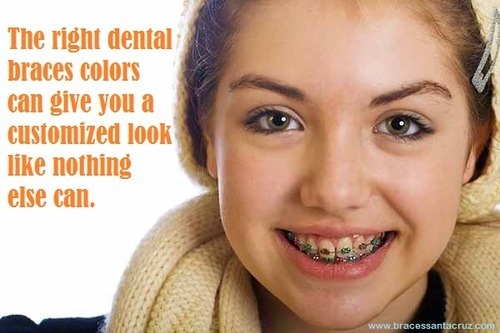 Once you have chosen the color that suits you and you have picked on, let your orthodontist know about it. Once your colored braces are on, you will surely not be able to stop yourself from smiling after the color braces are on. So, go on and choose colors that have significant meanings to them such as the patriotic colors or your favorite ones. You need not any longer dread having braces on your teeth as it can be a fun way of adding color to life. Before you go to the orthodontist have a few colors in mind. This will make your choice easier as you will be able to make up your mind quickly.